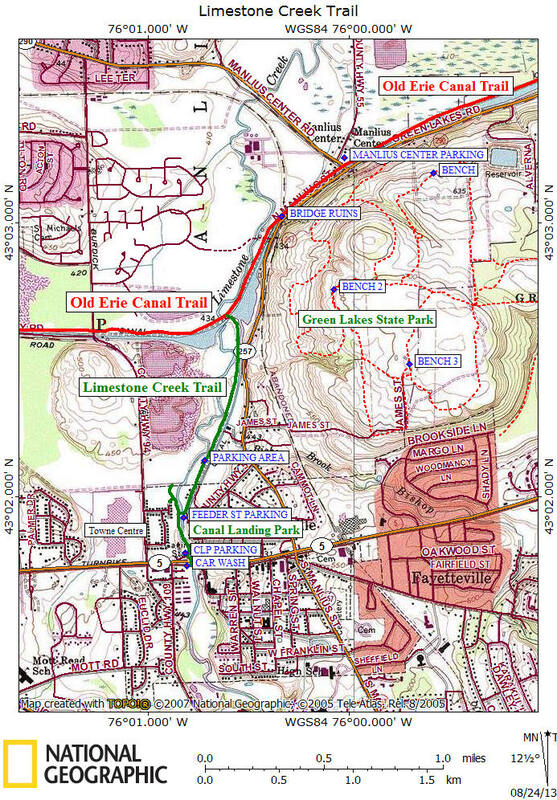 The Limestone Creek Trail is actually multiple trails located in the Town of Manlius and the Village of Fayetteville. A 0.9 mile section of the trail follows Limestone Creek and a Feeder Canal from the Old Erie Canal Trail south to the bridge over Limestone Creek (see panorama above) at the Feeder Street parking area. After crossing the bridge the trail follows Limestone Creek for 0.4 miles both north and south in the Village of Fayetteville's Canal Landing Park. The trail is utilized by walkers and bikers. There is a nice scenic view of the creek at the northern end of the trail as Limestone Creek is at a bend. This point of the trail is more of a hiking trail and there is a concrete culvert at the end with "KEEP OUT" painted, warning you not to continue. As you travel south in Canal Landing Park, you'll find numerous side trails that can be explored. There is also a work out course, benches, picnic tables and a playground. The main parking area for the park is located off Limestone Plaza. We recommend crossing Limestone Plaza and take the "trail" across the road, which is now a sidewalk to under the NY 5 bridge. The creek is scenic here. Access to the Limestone Creek Trail is from multiple locations. From the Old Erie Canal Trail you can park at the Burdick Street parking area (GPS N43 02.612 W76 01.259) and take the trail east 0.5 miles to the bridge over the Old Erie Canal on your right. Or park at the Manlius Center parking area (GPS N43 03.236 W76 00.024) and take the canal trail west for just over 0.8 miles to the bridge over the canal on your left. There are three parking areas for the main Limestone Creek Trail. The first is actually along part of the trail that follows along the Feeder Canal. This is actually the gravel section of Feeder Street. The parking area is located at the end of the road, on the left, near the gate for the trail. The GPS coordinates are N43 02.131 W76 00.718 for those who have a GPS devise. There is a smaller parking area on Feeder Street near the Limestone Creek Trail Bridge as well. The GPS coordinates are N43 01.937 W76 00.798. 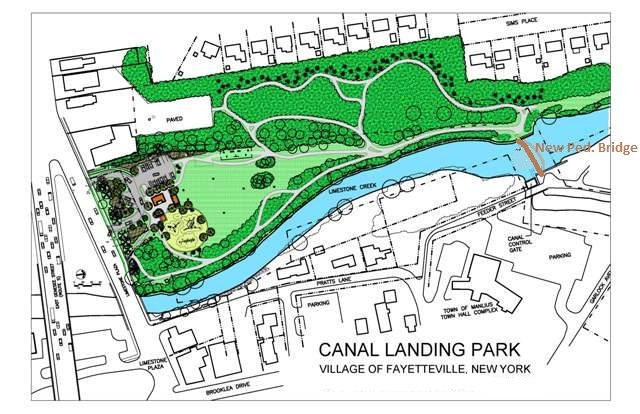 The main parking area for Canal Landing Park is off Limestone Plaza, near the junction with NY 5 in the village of Fayettevile, just east of Towne Centre Shopping Plaza. The GPS coordinates are N43 01.785 W76 00.812 for this parking area. Look below for a few pictures and a couple of maps of the Limestone Creek Trail. (c) 2006-2010 CNY Hiking - All rights reserved. Any use of information from this site without permission is strictly forbidden.